Lok Sabha adjourned amid TDP protest over special state category for Andhra Pradesh - Integration Through Media ....! NEW DELHI: The Lok Sabha was adjourned abruptly on Wednesday amid protests by the Telugu Desam Party (TDP) over special category status for Andhra Pradesh, among other demands. Minutes after the House assembled for the day, opposition members holding placards and raising slogans approached Speaker Sumitra Mahajan's podium. Despite repeated request for them to calm down, when Mahajan was unable to run the proceedings, she adjourned the House. 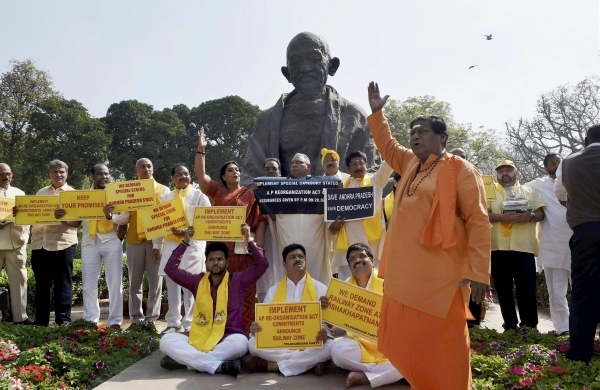 Earlier, the TDP MPs had staged protests near the Mahatma Gandhi statue.